Join the 23,000 dentists over the past 32 years that have benefited from attending Dr. Rondeau’s courses. Get started today! Join Us For Our FINAL & BIGGEST Conference Yet! 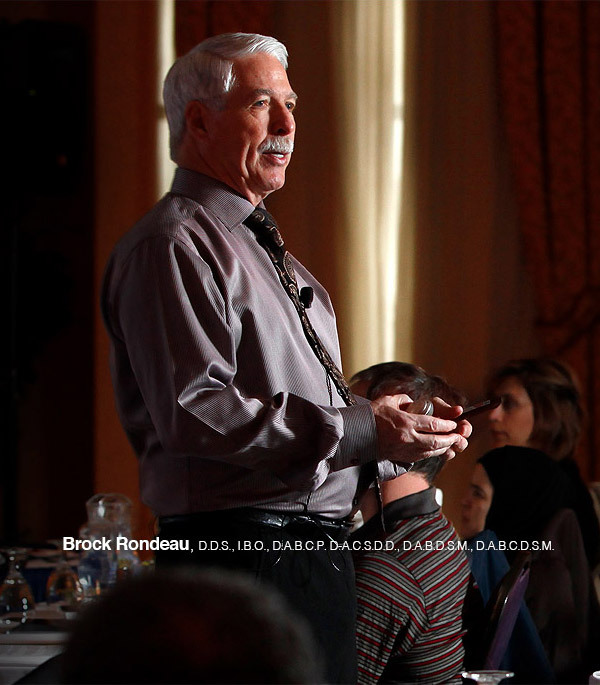 Dr. Rondeau is one of North America’s most sought after clinicians who lectures over 100 days per year. He is the past president and master senior certified instructor for the International Association for Orthodontics. Over 23,000 dentists have attended his seminars, online courses and study clubs in the United States, Canada, China, Australia, England, Turkey and Poland. He has an extremely busy practice, which is limited to the treatment of patients with orthodontic, orthopedic, TMD, and snoring and sleep apnea problems. Dr. Rondeau is a Diplomate of the International Board of Orthodontics, a Diplomate of the Academy of Clinical Sleep Disorders Disciplines, a Diplomate of the American Board of Dental Sleep Medicine, and a Diplomate of the American Board of Craniofacial Pain, and a Diplomate of the American Board of Craniofacial Dental Sleep Medicine. He has published over 30 articles in orthodontic and dental journals and has produced a series of videotapes on all phases of orthodontics as well as extensive internet courses in Orthodontics, TMD and Snoring and Sleep Apnea. Dr. Rondeau has written two chapters in medical and dental textbooks. One on early treatment and functional appliances and another on oral appliance therapy for snoring and sleep apnea. "Dr. Rondeau's Course is unbelievable!" I believe you learn more in the four dental CE sessions about child development and teeth development than you learn in all of dental school. But besides that, as a general practitioner, is that we want a return on our investment when we go to a course and we also don’t want to invest a ton of money in starting something. With Dr. Rondeau’s course, you can start doing these cases right away! We have two practices in Orange County and this is our 4th or 5th time coming to Dr. Rondeau’s dental continuing education seminars. We are hooked on his seminars. He is a very good speaker and always has new techniques that we appreciate and learn each time that we come back. We think that there’s always room to improve. You will learn a lot from this and it will take you to new levels in your profession. I’ve finished 4 dental CE sessions of his level 1 course and it’s made me so comfortable now to start my cases. I’ve already finished 3 cases and have 14 in the pipeline. I’d highly suggest anyone come that are looking to learn orthondic fundamentals. Most children with crowded teeth and bad bites have narrow jaws and underdeveloped lower jaws, which could be corrected with functional appliances. Functional appliances help correct the bone problems, while the tooth problems are corrected with the orthodontic braces. for a more comprehensive search. Check out our mobile friendly apps so you can access all of the best information and content. Please select which seminar(s) you’d like to attend by clicking the "I'm Interested" button, then you can either complete registration, or continue browsing. Start Your Registration Process Now! Please enter your information here so we can start the process of getting to know you, and to help you to expand your practice through continued education!